The most successful track & field coach in Atlantic Sun history is sure to call Jacksonville University home for several more years as Director of Cross Country/Track & Field Ron Grigg was signed to a five-year contract extension. Grigg has made the Dolphins track program a beacon in the Atlantic Sun Conference by winning both the A-Sun Indoor and Outdoor Championships in each of the last nine seasons – earning “Coach of the Year” in all 18 of those titles. He was also given the distinction for cross country in 2009 when he led the Dolphins to the only triple crown in A-Sun history sweeping the women’s cross country, indoor and outdoor titles. “They don’t come any better than Ron Grigg,” said Chief Athletics Officer Dr. Donnie Horner. “Honest, hardworking, focused, talented, technically competent, Ron is a value-based leader of character and master teacher of the finest order. The high achievements have followed the program into the classroom. The Dolphins have earned USTFCCCA All-Academic Team recognition for 13 consecutive years (2002-14) while producing nearly 400 A-Sun All-Academic performers. Also, the cross country, and indoor and track teams have received NCAA Public Recognition for having an APR in the top 10% nationally the last several years. Grigg’s era at JU includes seven different individuals who have totaled 13 All-American honors as well as 23 NCAA Championship qualifiers. The list includes Monique Tubbs who became the school’s first national champion winning the 2001 indoor 60-meter dash (7.29) and five time All-American Natasha Harvey who secured seven berths in the NCAA Championships and won 22 individual conference titles from 2006-09. Jacksonville University’s nearly 500 student-athletes compete in 19 NCAA Division I sports. 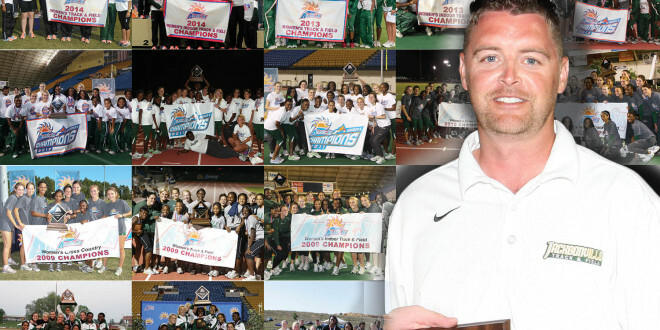 In 2013-14, the Dolphins won eight conference titles as JU won the Atlantic Sun’s Sherman Day Trophy, awarded to the women’s all-sports champion. In the last two years, beautification upgrades were completed to Historic Swisher Gymnasium; the Debbie & Fred Pruitt Softball Complex was officially dedicated; enhancements were made to Sessions baseball stadium; work began on a new football/lacrosse stadium at Milne Field; and construction was completed on the Southern Oak Soccer Stadium, the Swisher Golf Practice Facility and the Dolphin Sand Volleyball Facility. For more on the JU Dolphins, visit judolphins.com.